Provision has always been made to allow for transducer withdrawal from the process under pressure, to facilitate inspection or maintenance without shutdown. The traditional design to enable this has been based on a single ball valve, which, whilst providing adequate isolation, does not offer the increased safety delivered by double block & bleed valves (DBB), which afford both primary and secondary process isolation and the means by which to dispose of unwanted gas and liquid trapped within the assembly. 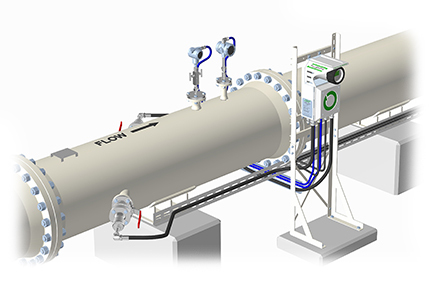 Due to the criticality of the measurement and the proven performance of the installed meter, ABLE Instruments, as Fluenta’s exclusive UK engineering solutions partner, were asked to upgrade the installation to the latest generation variant, the FGM160. ABLE’S preceding survey report recommended the deployment of double block & bleed valves to augment the isolation strategy. The valves constitute a reduced face to face design, matching the single valve footprint and accommodating standard length transducers. The proposed upgrade was accepted and approved as meeting the operator’s double isolation criteria for equipment installed directly into the process. Double Block & Bleed valves offer enhanced safety, particularly for flare lines with high H2S content, by way of an additional protection barrier and the ability to bleed hazardous gases during transducer extraction.